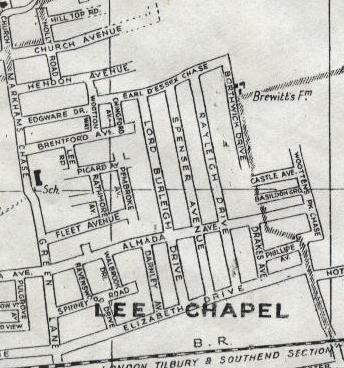 A larger street plan from c.1950 showing Lee Chapel in more detail can be viewed here. St. Michael's Mission Church Church Wooden built structure in use from 1935 to the early 1960s. Replaced a former church that stood on the south side of the railway in Salisbury Avenue. Cadbury Detached Bungalow Plot 272 and 273. Purchased in 1925. Villa Detached Bungalow plot 270 and 271. Purchased in 1925. Ockholm Detached Bungalow Still standing in June 1962. A surviving bungalow property in Rayleigh Drive called St. Elmo in 1973 became the new Basildon headquarters of the Samaritans which it remains today, although the address has changed to 16 Little Lullaway.